A peak behind the curtain of long sermonizing. Why does the preacher preach so long? There are several answers to that question, but what is long? Contemporary wisdom would have sermons to be 18-24 minutes long. Short attention spans, sound bites, and fast moving media today make even that length seem a little long for sermonizing. How long a person thinks a sermon should be is probably going to coincide with what they think a sermon is. If a sermon is just a pep talk or a few nuggets of wisdom for life, then 20 minutes may even be a little bit long. Of course, that’s not a sermon in any biblical sense. A sermon is the opening up of God’s word, explaining it, and applying it. A sermon involves teaching and exhortation. Sermons are supposed to be a preaching of the Word (2 Timothy 4:2) and the food of God’s people (Acts 20:28; John 21:15-17). Just as our bodies require consistent nutrition to function and flourish, our souls require a steady and healthy diet of God’s Word. Just as it takes longer to eat an eight ounce steak than it does a handful of popcorn, it takes longer for a meaty sermon to be preached. How long a sermon should be ideally will have to be a topic for another day. I want to give some reasons for long sermons for consideration. The following list is not in any particular order. Mistakes – Preaching is an all-consuming task and focusing on time is difficult. It could be that a long sermon is the result of losing track of time or even miscalculating. I have made mistakes calculating time during a sermon and ended up either unnecessarily rushing through or going over long. Of course, the over long mistakes get more complaints. Incompetence/Inexperience – Over time you learn the relation between the amount of material to be preached and the length of time it will take to preach it. Sometimes long sermons result from insufficient experience to gauge the time it will take to preach them. Insufficient outlining or notes – A good outline or notes helps the preacher to know where they are in the sermon at any time. They help keep the sermon on track and help you know where you can spend more time or if you need to trim down on the fly. 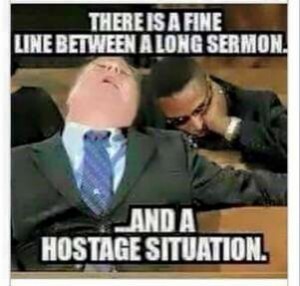 Preachers that preach off-the-cuff have no such guide and time management is much more difficult for them. Sometimes they just go until a certain time on the clock and then stop. Sermons like that are not usually complete sermons but more a collection of thoughts. Skill – No two men are gifted exactly alike and some have a skill for being concise that cannot be matched by others. Experience can play a part here too, but some men are able to say more in thirty minutes than what others can in forty-five or fifty. With continual study and work, all preachers should be able to sharpen up over time but some will still never be able to match those with succinct gifts. Overload – Long sermons can be the result of overload where every sermon attempts to cover the whole Bible or whole scope of systematic theology. These sermons tend to lack a central focus and are more often found in younger, inexperienced preachers. Sermons should have a central theme or main point and not try to cover too much at one time. The old saying is that young preachers preach everything they know every time they get up to preach. Amen and ouch. Mismanagement – Long sermons can also result from mismanagement of time where too much time is spent on rambling, rabbit trails, jokes, and stories. If a preacher spends too much time on these, he has a choice of going long or shutting down a sermon without actually covering what he intended to cover. Preparation time – This is probably the reason that many people don’t realize is a reason. Preaching shorter sermons well actually requires more study and preparation time. So to preach a good thirty minute sermon will take more preparation time than to preach that same sermon in forty-five minutes. So long sermons could be the result of laziness to not put in the required work to sharpen them up or they could also be the result of a lack of time for the preacher. For instance, if a preacher works a full-time job in addition to pastoring, he’s probably not going to have enough time regularly to preach shorter sermons. There could be all kinds of time-restraints that could cause this. Blaise Pascal once wrote a response to a friend’s question and apologized for the letter being so long. He famously quipped at the end of the apology that he didn’t have time to write a shorter one. These are a few reasons behind long sermons. Sometimes preachers are just what we call long-winded where they go on until they run out of things to say without any regard for time. I have also noticed that preachers that preach good sermons in shorter times, say 30-40 minutes, tend to be older preachers who have been at it a long time. The recommendation is to have patience and realize experience will play a big part in your preaching and time management and you can’t get experience over night. Believe me, I’m still working at it. I am probably classified as a long-winded preacher by many but I am a work-in-progress.